What if a childless man in his forties discovers that he has a daughter, the result of an affair twenty-five years earlier? What if the daughter is pregnant? And what if she's on the run for murder? James wasn't much more than a child when he had an affair with Lily. Now, 24 years later, Lily confesses to James that their affair led to a daughter, Kate. And Kate desperately needs her father's help, because she is wanted for murder. Yet there is no room for murder in James's life--he has a wife, a good job, and a nice house in the country. Kate comes crashing into his world, and lights the fuse under his ordered life. Because James has also been keeping a secret--a very dark and deadly one. 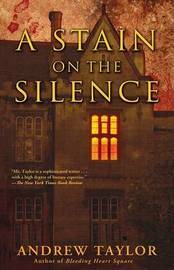 A Stain on the Silence is Andrew Taylor at his suspenseful, page-turning best. 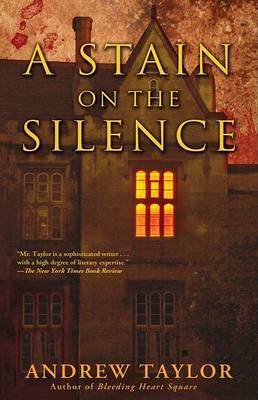 Andrew Taylor is the author of many crime and suspense novels. The recipient of the Crime Writers' Association 2009 Cartier Diamond Dagger for sustained excellence in crime writing, Taylor has also won the CWA's John Creasey Award, an Edgar Scroll from the Mystery Writers of America, an Audie, and two CWA's Ellis Peters Historical Daggers (a unique achievement), as well as a shortlisting for the CWA's Gold Dagger. His website is . www.andrew-taylor.co.uk.